Sign up to receive a copy of Health News Magazine delivered directory to your home! 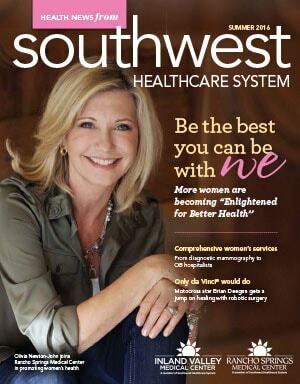 Health News from the Southwest Healthcare System is a publication designed to bring you the latest news as well as health and wellness information you can use throughout the year. The benefits of surgical weight loss can range from improved health to a higher quality of life. April Marquez welcomes daughter No. 3 at the Childbirth Center at Rancho Springs. Robotic surgery was the preferred solution for motocross enthusiast Brian Deegan when complications from an old injury threatened to ground him.